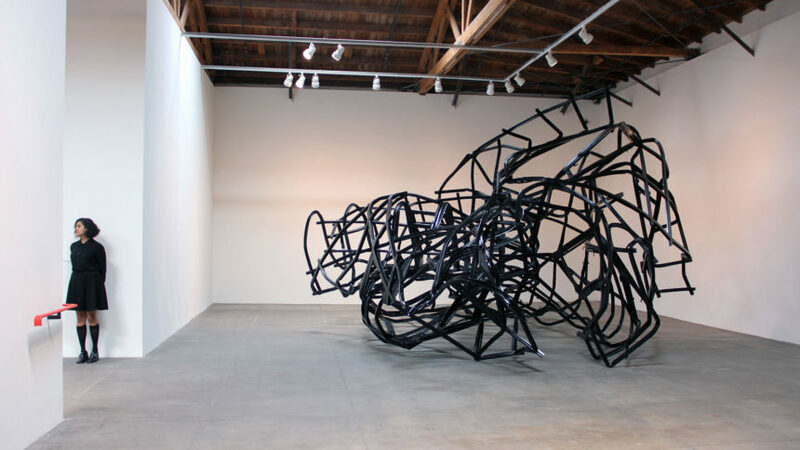 Opening on Saturday, July 1 at Hauser & Wirth in Los Angeles are two new exhibitions. Both are uncannily familiar and disconcertingly surreal, but that’s about where the comparisons end. Paul McCarthy’s ‘Paul McCarthy. 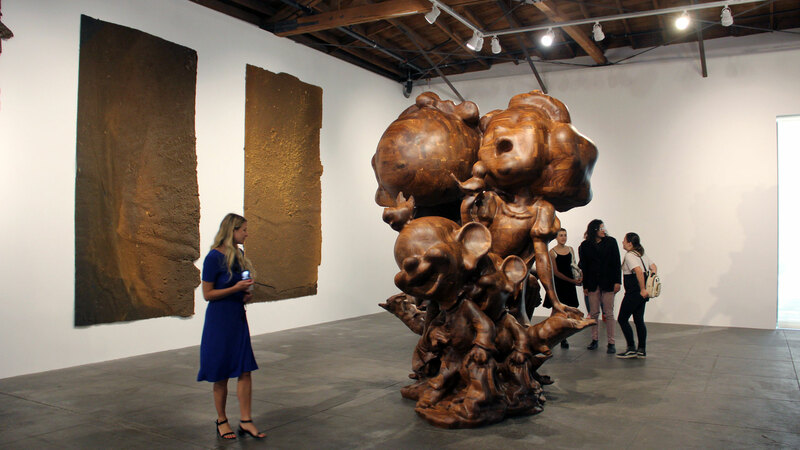 WS Spinoffs, Wood Statues, Brown Rothkos,’ is devoted to the provocative and influential work of the acclaimed Los Angeles-based artist. The never-before-exhibited-in-LA exhibition presents ‘spinoffs’ from White Snow, a major ongoing project within the artist’s multidisciplinary practice that subverts the beloved 19th century German folktale Schneewittchen (Snow White) and the modern interpretation of that story in Disney’s 1937 animated classic Snow White and the Seven Dwarfs. 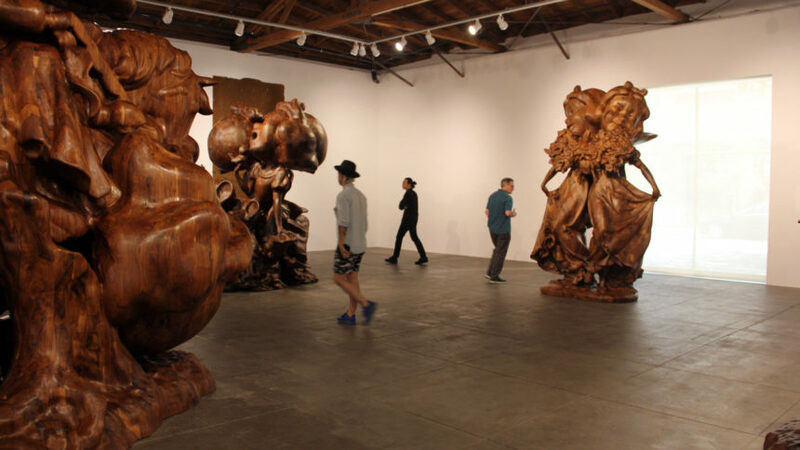 On view in the North A gallery are nine monumental sculptures of Snow White, the Prince and Dopey, each impressively (and laboriously) carved from black walnut. Surrounding those are McCarthy’s Brown Rothkos, sculptural, monochromatic wall hanging that seek to disrupt traditional notions of art and culture, while also showcasing the boundlessness of McCarthy’s own performance as artist. Over in the North B gallery Monika Sosnowska’s self titled exhibit presents a new body of sculptural installations that riff upon both history and personal experience. It’s the first Los Angeles solo exhibition for the noted Polish artist and is remarkable in its scope as well as its intersection of art and architecture. Sosnowska’s six Brutalist-referencing monolithic sculptures simultaneously reinforce and question the audiences haptic perceptions of human-made space. “It’s very deep if you let it take you there,” says curator Heather Pesanti of the artist’s social and political commentary and dystopic forms. Both exhibitions are open from July 1 – September 17, 2017 at Hauser & Wirth Los Angeles, 901 East 3rd Street.